We bought 'Lana' off a well known auction site for �73.00 in April 2012. Couldn't wait to try her out, so took her to the East Coast for an outing. The fly sheet is thick, lovely Cabanon canvas, the frame really sturdy steel poles. Yes, they are heavy, but boy can they stand up to anything they have thrown at them! The poles went up easily, they were joined by springs all over the place, so there were only about 5 sections to put together in the end, but it was fairly obvious where everything went. The plasticised roof meant that the rain sounded a little louder than on our Relum, but nothing too bad, it certainly didn't wake either of us during the night. The kitchen area was a great bonus for us, as we could finally cook inside without falling over everything. The zips, windows, curtains etc are all of superb quality (and hardly look used)so we are completely in awe of this tent. Slight downside is that during one of the downpours, the seam between the main roof and the kitchen bit started to leak.Am hoping that now the tent has been used it will be OK if the fabric has swelled a bit. Other than that, we are extremely chuffed with it. We bought a cheap tarp to use as a groundsheet and it worked fine, so no issues there. 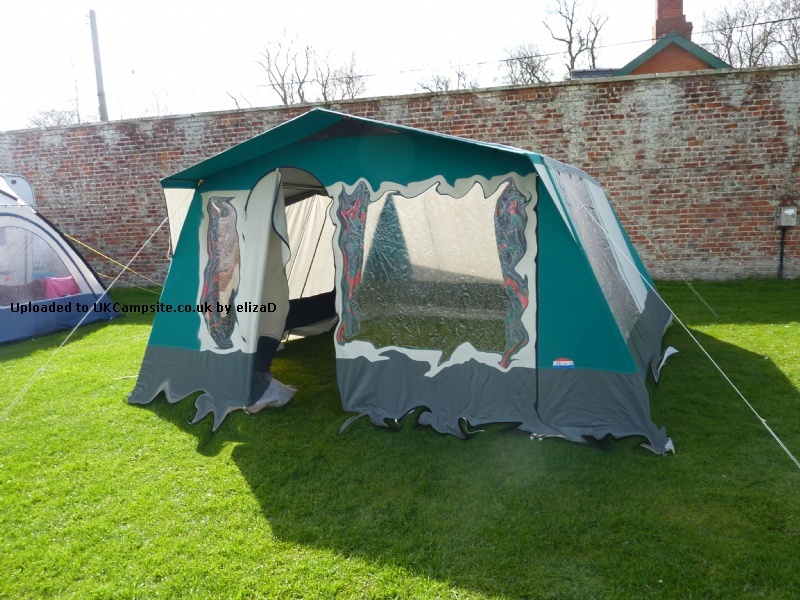 This is a seriously good tent which could already be 20 years old, but still has plenty of life in it. For 2 of us it's like a palace! If you see a good deal for one of these on eBay, preloved or wherever, go for it, you won't regret it. Add your review of the Las Palmas!